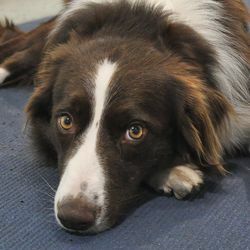 “Molly’s nose is cold and wet, so she must be in good health.” A lot of people believe the texture and temperature of a dog’s nose is a reliable barometer of how she’s feeling. While there’s some truth to this adage, it’s not as simple as it seems. The appearance to your dog’s nose can definitely tell you something about her overall health, but it’s important to separate fact from fiction. To do so, we spoke with holistic veterinarian, Dr. Patrick Mahaney. PM: The classic perspective of a dog’s moist nose indicating the utmost picture of health isn’t necessarily always the case. Just like the skin (the body’s largest organ), the nose is an indicator of overall health, but should not be the exclusive means of determining if a dog is well or ill.
PM: It should appear uniform in size (the right side equaling the left), and be moist to mildly dry to the touch. Look for smooth and consistent airflow in and out of both nostrils (more noticeable with a closed mouth). The nose should lack textural and pigmentary changes, both on the surface and in the deeper tissues, and should exude only small amounts of clear discharge. PM: First, let’s explain what is meant by “running”. From my perspective, a “running nose” indicates the presence of some form of nasal discharge. Whether it’s clear liquid, thick opaque mucus, or blood, all discharge from the nose can have mild to severe potential associations with underlying health conditions. •	Clear discharge: Often a normal occurrence in small quantities. However, irritation from inhaled environmental allergies (smoke, perfume, air freshener, pollen, etc.) can irritate the nasal passages and lead to an increased volume of discharge. •	Thick opaque mucus: When irritation becomes more severe, or infectious organisms like bacteria grow in the nasal passages, the consistency and color of the discharge becomes more opaque and thicker (respectively). •	Blood: Also called epistaxis, blood emerging from the nose can result from mild to severe trauma to the tissue at the outermost part the nose (nasal planum), where it meets up with the outside environment; or deeper in the mucous membranes lining the nasal passages. A penetrating injury, blunt trauma or scrape to the surface of the nose can cause bleeding that will typically stop with gentle pressure and by calming the dog down (sometimes requiring sedation and pain medication). When a piece of foreign material enters the deeper nasal passages and becomes imbedded there, or when a tumor grows and destroys normal tissues, there’s a higher likelihood that blood vessels will be eroded and major bleeding will occur. PM: The nose’s texture and the development of scaling (skin fl aking) or sores that don’t heal or are slow to heal, can certainly correlate with underlying health issues. Nasal hyperkeratosis is a disorder commonly seen in older dogs or certain breeds (e.g. cocker spaniel, Labrador retriever) where the nose takes on a dry, callus-like or cobblestone appearance due to excess production of keratin. It can be associated with a dog’s genes, dry eye (keratoconjunctivitis sicca or KCS), or even blocked tear ducts. PM: Specific diseases that manifest as abnormalities on the nose include immune-mediated (autoimmune) conditions such as pemphigus foliaceous (PF) and discoid lupus erythematosus (DLE). These skin diseases affect many mixed and pure breeds, with the Nordic (malamute, husky) and herding (Australian shepherd, cattle dog, collie) breeds being most susceptible. PF and DLE cause irritation, crusting and the development of secondary infections (bacterial, fungal, etc.) at affected sites, especially on the nose or the bridge of the muzzle. Squamous cell carcinoma (cancer of the skin’s squamous cells); adenoma (cancer of glandular tissue); lymphoma (cancer of the lymphocytes, a type of white blood cell), and others can alter the gross appearance (size, shape, etc.) of the nose, and even create a nodular consistency to its surface. Copyright of this article (2013) is owned by Dr Patrick Mahaney, Veterinarian and Certified Veterinary Acupuncturist. Republishing any portion of this article must first be authorized by Dr Patrick Mahaney. Requests for republishing must be approved by Dr Patrick Mahaney and received in written format.